One day before the main event and Uluwatu Beach is thriving with life, thanks to the extensive preparations by Uluwatu Surf Villas and Rip Curl for their fundraiser for local environment organization Eco Surf Rescue Uluwatu (ESRU). The activity set for tomorrow, July 21 (Saturday), features ocean and surfing-inspired art, music, and film showings. The event is also a focal point in Rip Curl Cup’s opening week, as the Rip Curl Cup Padang Padang Invitational is set to commence in a few days. Thousands of surfers and surfing luminaries regularly attend the annual invitational, and there is no reason to believe that this year’s event will not be as star-studded and action-packed. 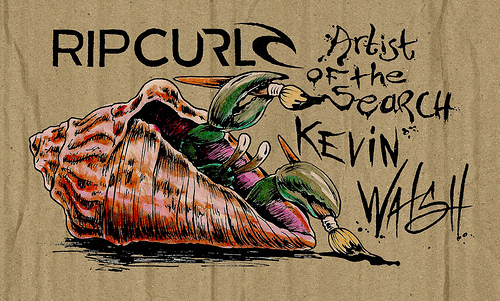 The artwork by Rip Curl’s Artist of the Search winner Kevin Walsh is probably Rip Curl’s largest contribution to the event, as there will be a large exhibit featuring exclusive hand-made pieces by the 28 year-old Santa Cruz, California native. Walsh’s pieces have been selling like hotcakes in the previous decade, and his ocean-inspired captivating designs make it easy to see why. As a tribute to the event, the young artist focused on the majestic surf breaks of Uluwatu and Padang Padang in his new pieces, and he will be selling them in the event to help raise funds for the ESRU. A Kevin’s Artist of the Search T-shirt Collection is also available for retail during the event. The fundraiser begins at 5PM, where catered food, full bar service, and live band performances can be enjoyed by attendees with the admission price of IDR150,000. 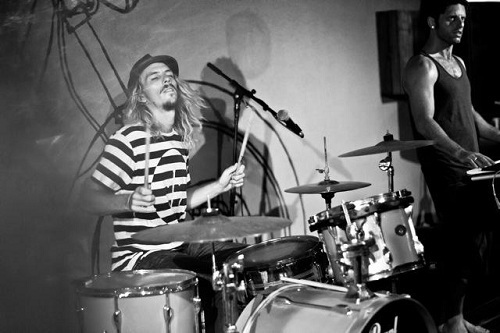 Andy Six String is the highlight of the live band performances, so expect to be entertained with the hippest music in town until the wee hours of the morning. Taylor Steele’s newest film is also another good reason why you can’t miss this event that many are calling “one of the hottest surfing events of the year”. “Here & Now” will have its premiere in Asia at the very heart of the event, as well as some of the film entries in this year’s Ombak Bali Film Festival. 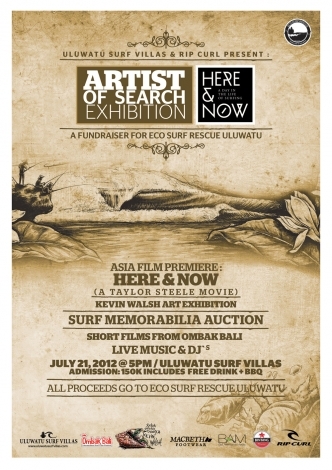 Why Attend and Help Eco Surf Rescue Uluwatu (ESRU)? 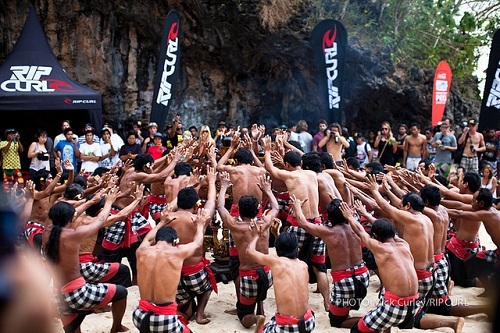 Aside from the loads of fun you can expect from attending the event, you also get the opportunity to help ESRU in its noble effort to help preserve the beauty of Uluwatu. With the ultimate goal of making the site a World Surf Heritage Area, the non-profit organization has been working to address its pollution problems for the past few years. Since all the proceeds of the event will be donated to ESRU’s noble purpose, the solid waste and recycling system installed by the organization will be assured of smooth operation for the following months to come. ESRU also plans to install an advanced and eco-friendly liquid waste system to alleviate the problems caused by leaking sewage and kitchen waste water. To learn more about ESRU’s upcoming projects or to make a donation, simply visit http://www.ecosurfrescue.moonfruit.com. This entry was posted in News, Surfing, Water Sports and tagged Fundraiser, Rip Curl, Rip Curl Cup Padang Padang Invitational, Surfing, Uluwatu Surf Villas. Bookmark the permalink.